Can't make it to see the museum in person yet? Enjoy an online visual tour of just some of the exhibits you can see, narrated by Melodie Chenevert! Come Take an Online Tour! 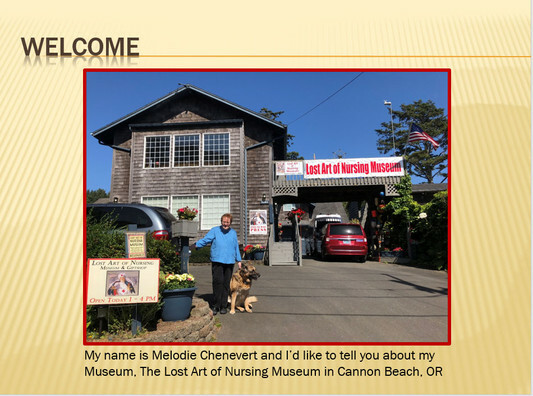 Not everyone can get to the Oregon coast to visit the museum. It’s a shame because my museum’s visitor book is full of exclamation marks!!! The most frequent words are: amazing, awesome, inspiring, excellent, enjoyable, educational, fabulous, fascinating, fun and WOW! The most frequent phrase is “Thank you!” … for sharing…for keeping the spirit of nursing alive…for honoring our profession in such a wonderful way. It’s been described as a “joy-filled, magical journey through nursing” that brought “a smile to my heart” and “tears to my eyes” – I am so proud to be a nurse!" A non-nurse wrote, “I’ve been to a number of small, private museums and this is by far the best organized and most well displayed of any I’ve seen, THANK YOU!"